After the rough and tumble of Springfield and life in politics, I was greatly looking forward to heading to Missouri last weekend to a Sankey Rodeo School, to tune up my hobby before the summer rolls around. The school is run by a hero of mine, Lyle Sankey, one of only a handful of individuals to qualify for the National Finals Rodeo in all three rough stock events. Lyle is a champion and he not only teaches rodeo, he teaches life lessons. More than a few things I’ve learned from him have been applied to get me to my current position in life. I have never been as good at riding broncs as what I’ve wanted, but I love the effort and I can’t get the sport out of my blood. It is a great release from the stress of Springfield. I was convinced that a few minor adjustments to my saddle would get me ready to go and I’d be primed to have a successful weekend. I was partially right. According to my wife, I had a good ride on a decent bucking horse and I made the 8 second whistle. After the whistle blew, I patiently waited for the pickup men to ride in where I could jump off, onto one of their horses and land safely on the ground. As I waited, the bronc ducked hard to the right and I took a tumble landing head first in the arena. Apparently, I was completely unconscious for around a minute. The first thing I remember was waking up in the hospital in Springfield, MO on Sunday morning. The wreck rattled me a bit and it took a bit to get me into the swing of things this week, but I was determined to toughen up and get right back to representing our district at the Capitol this week. After all, the best medicine is to get right back in the saddle, and this week that is exactly what I did, as legislation started moving quickly this week. Although the volume of bills increased dramatically, most of the legislation we voted on where smaller issues. We approved two really good bills this week. My colleague Representative John Cabello sponsored an initiative to reduce license fees for Veterans by 50%. It passed overwhelmingly, along with another measure sponsored by another Republican member, Dan Swanson, that allows for anyone who served in the military between 1945 and 1992 to get a Cold War Veteran license plate. These are two small measures to help honor our heroes in uniform that have valiantly served our Country. It is always great to see constituents in Springfield, and I was able to meet with several on Wednesday. There was a group of concerned constituents who were here for the Right to Life Rally, and I enjoyed our discussion on the issues. I met my good friend, Mayor Deb Feinen from Champaign and the Illinois Land Title Association. I had a meeting with some local optometrists, members of Champaign’s Moms Demand Action group, the Eastern Illini Electric Cooperative, and my favorite group of the day, students from the Oakwood and Georgetown FFA. FFA is near and dear to my heart since I was a member in high school. With the day being as busy as it was, I missed a chance to meet up with local firefighters, but I will make it a point to get together with them in the district. I always greatly appreciate constituents taking the time to come see me and if I can make time for them, I always will. If you cared enough to come over, the least I can do is take the time to visit with you. Some groups who I get a chance to visit with are people that I strongly agree with and some are groups that have a differing opinion from me. Regardless of whether our viewpoints are the same on any particular issue, I will always listen to the viewpoint and give it consideration. I encourage everyone back home to reach out to my office to let me know how you feel about the various issues we face in the state. The feedback I hear from folks back home helps me decide what is the best option for the 104th district! 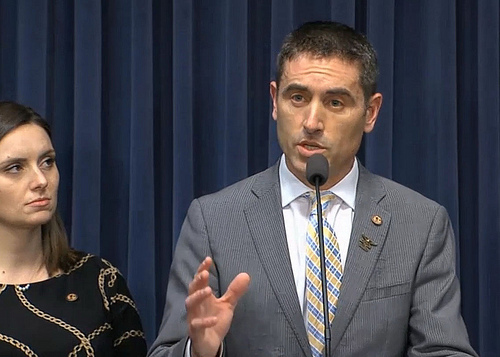 This week, I filed Joint House Resolution 47 to form the Illinois Coal Ash Task Force. This is a proactive step to work to solve the Coal Ash issue at the old Vermilion Power Station. 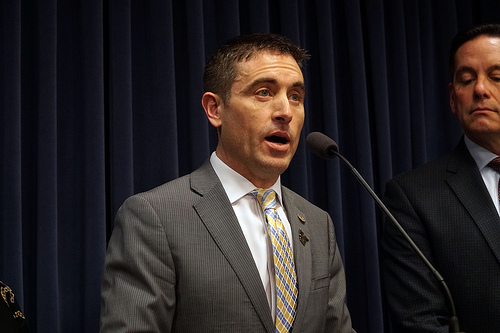 There is a real environmental danger on the Middle Fork River and a great liability both to local Vermilion County taxpayers and to the taxpayers of the State of Illinois. The Coal Ash needs to be cleaned up. There are also economic realities presented by the changes we’ve seen in how we generate energy. The only way to ever find a workable solution to this problem is to get the stakeholders to sit down together and figure out a practical way forward that is environmentally responsible, based on scientific data and analysis, and is workable for all sides. That is the mission of the Task Force. If the Task Force is successful, it can provide a template and a model for handling coal ash issues across the State in the future. It is time to bring everyone to the table to find a workable solution to this problem. The rodeo arena has taught me a lot about life, but most importantly that life is a fight. There are ups and there are downs. It taught me that when you get bucked off and thumped on the head, you get back up and you get back in the saddle. 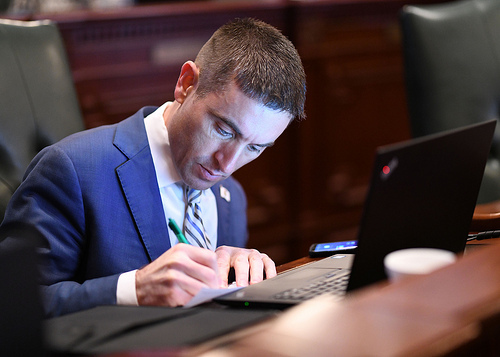 I got back in the saddle this week and you can bet that I’ll be right back in the saddle next week, doing my best to represent the 104th district in the Illinois House of Representatives. It is going to be a heckuva good ride.